Thanks to the holidays, I was lucky to squeeze in one more trip this year — to Nashville! Known as Music City and for honky tonk, I figured I’d be listening to twang at every turn. But, as you’ll see, there’s so much more to Nashville than its country roots. In this post, I share the hot spots I visited over 3 days, ranging from music and landmarks to museums and parks. Since Nashville is known as Music City, let’s start with Opry at the Ryman. Back in 1925, the Grand Ole Opry began as a radio broadcast showcasing country music. Today, you can still listen to the Grand Ole Opry on the radio, or watch it live via Opry at the Ryman Auditorium downtown. The 2-hour variety show starts off a little cheesy and is peppered with advertisements, but it features nearly a dozen country and contemporary music performers giving you a sample of their style. The acoustics in the Ryman are some of the best I’ve ever heard. Vince Gill, Rodney Crowell and Charlie Worsham closing out the night. Speaking of music, let’s talk about the famed Honky Tonk Highway, down the street from the Ryman, where bar after bar is packed with music lovers listening to up-and-coming music stars. For a slightly less touristy stop, bypass Blake Shelton’s and Jason Aldean’s bars. Instead, venture to the lower end of the strip to Acme Feed & Seed, where you can choose your own adventure by floor. When I walked in, rock and rollers McKinley James were playing for a small but enthusiastic crowd, so I ordered dinner at the bar and enjoyed their set. Had I gone to the second floor, I could have ordered sushi and watched the game, or walked up to the rooftop for views and a DJ. McKinley James. Fun fact: lead singer and guitarist McKinley is just 17 years old! 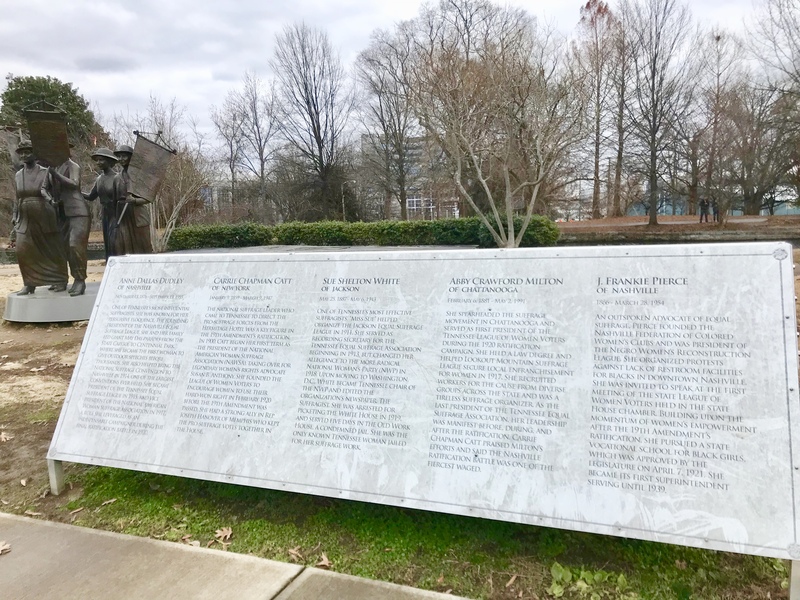 Once you get your music fix, head over to Centennial Park, where you’ll find a full-scale replica of the Parthenon. (As in, the Parthenon in Greece, dedicated to Greek goddess Athena.) What was constructed as a temporary exhibit in 1897 is now a permanent fixture and home to Nashville’s art museum. 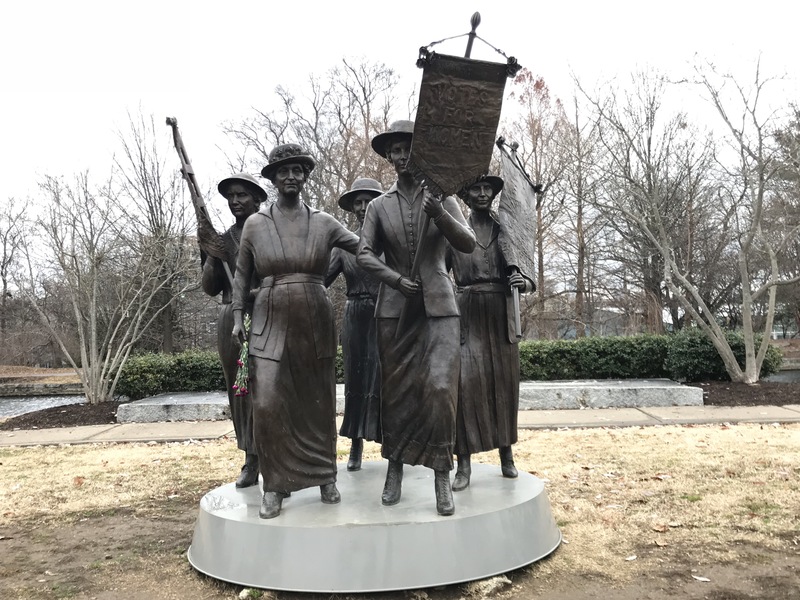 In Centennial Park, you’ll also find the Tennessee Woman Suffrage Monument, honoring the Tennessee women who secured ratification of the 19th Amendment which allowed women to vote. After perusing the park, visit one of the many museums Nashville offers. I chose the less touristy Lane Motor Museum, where I learned about 150 unique vehicles from all around the world. There are no barriers between you and the cars, and most are accompanied with stories of how they came to be. Even if you aren’t a car enthusiast, it’s a fascinating museum. My favorite car in the museum because of its giant grill, but also because (according to its description) it helped Auschwitz prisoners escape during WWII! After sightseeing for a couple days, I was ready to workout — and happy to find several hiking options nearby! Percy Warner Park, just 20 minutes southwest of downtown, has several trails. I chose the ~4.5 mile Mossy Ridge Trail, which I found to be moderately challenging. And muddy. Word to the wise: if it’s rained recently, it’s going to be really muddy, so wear hiking boots (RIP my favorite pair of sneakers). Also, it took me quite some time to find the trailhead, so let me spare you some time: the Mossy Ridge trailhead, along with parking, starts at the Deep Well trailhead. It felt great to hike after spending time playing tourist and eating and drinking everything in sight. Stay tuned for my next Nashville post about the restaurants and bars you need to try! Let’s talk! Tell me in the comments: Have you been to any of the spots in this list? Which ones? Where do I need to visit next time I’m in Nashville?